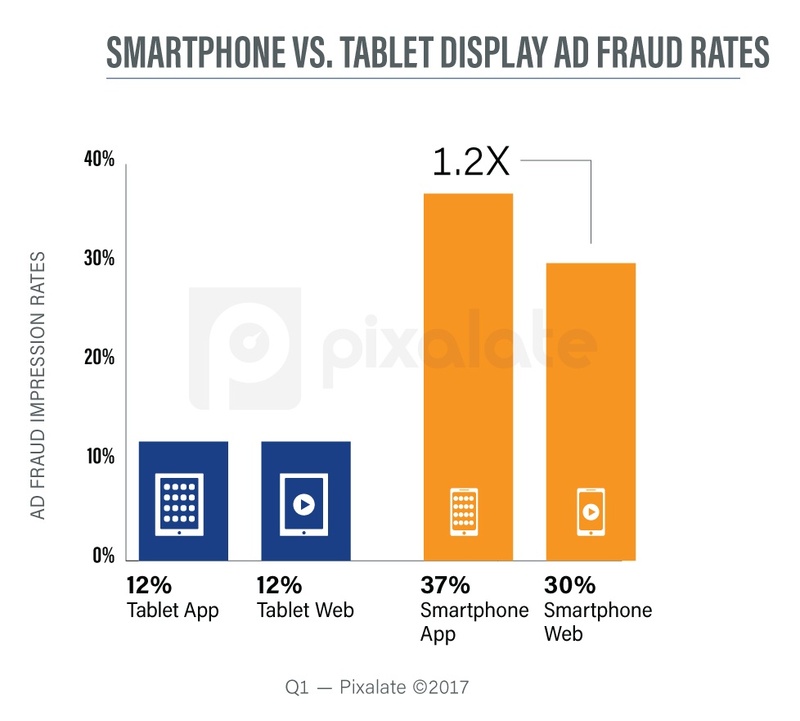 Pixalate’s Quarterly Global Ad Fraud Benchmarks series continues with a look at mobile in-app ad fraud rates in the programmatic marketplace. The ad industry often uses the word “mobile” to describe both smartphone and tablet inventory, but upon closer inspection, there are distinct, important differences between the two devices. Based on our research into Q1 2017 programmatic ad fraud trends, smartphone app display inventory is 1.2x more likely to be fraudulent than smartphone web inventory. Tablets, meanwhile, have equal app and web fraud rates, at 12%. This means that marketers are wasting upwards of one-in-three ad dollars spent on display advertising on smartphones, and upwards of one-in-ten ad dollars spent on tablet display inventory. Additionally, marketers should note that for mobile display advertising, smartphone inventory is up to 3x more likely to be fraudulent than tablet inventory. 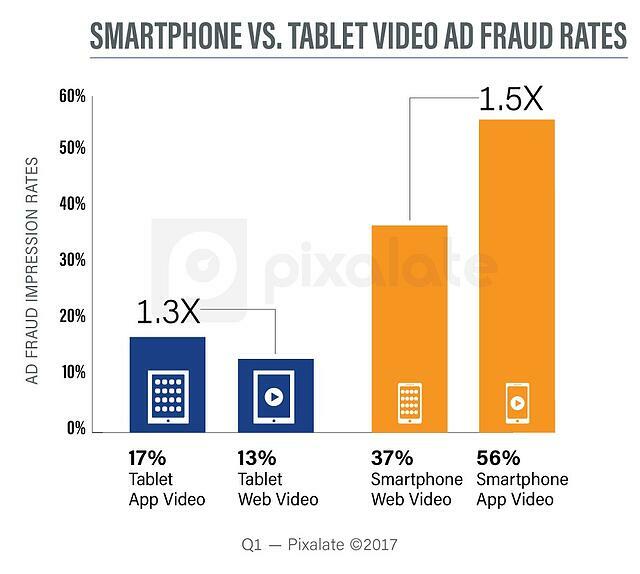 Tablet app video fraud was 17% in Q1 2017, while tablet web video was fraudulent roughly 13% of the time. Tablet app video inventory was 1.3x more likely to be fraudulent than tablet web video. Video ad fraud rates were much higher on smartphone devices. Smartphone web video inventory was fraudulent 56% of the time in Q1 2017 — 1.5x more often than the 37% rate for smartphone app video inventory. Overall, smartphone app video inventory was roughly 3x more likely to be fraudulent than tablet app inventory, while smartphone web video was roughly 5x more likely to be fraudulent than tablet web video. Buyers and sellers who treat all “mobile” app fraud prevention the same way should treat mobile for what it really is: Two distinct devices that require unique approaches. Marketers need to be especially careful when buying mobile video advertisements on smartphones — particularly web inventory, given that over half (56%) of such inventory was fraudulent in Q1 2017. This post is part of an ongoing series highlighting Pixalate's Quarterly Global Ad Fraud Benchmarks for Q1 2017.